Ready, set, dazzle! Get your party started on a positive note by decorating with this 2-Ply Metallic Table Skirting. This party decoration will amaze each and every single one of your guests as they sit down at their tables or visit the gift and/or food table. Measuring 30 inches by 14 feet ,so you will have plenty of this flame retardant material to decorate tables sticking out like a sore thumb. 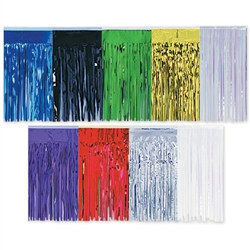 With this 2-Ply Metallic Table Skirting, you are transforming a drab table into a fabulous looking one in an instant. This party decoration is great for a plethora of holidays and events such as Christmas, Birthdays, 4th of July, Halloween, Mardi Gras, St. Patrick's Day and Valentine's Day. Just pick your color and holiday to which to decorate.